← Take the Channel 4 Hidden Talent test to see if if you have a natural ear for music! In the final few days before your exam, here is some information for parents and students to make sure you are properly prepared for the exam. This is partly written as a guide for parents but it has information of relevance to adult students too. You should perform all three pieces in a row to your family and friends. Make an occasion of it so that you feel under pressure as this will mimic the exam scenario. You can also record the performance of your three pieces and try to get them as good as you can in one take as you only get one chance to play them in the exam. Whatever happens – just keep going! Try not to restart – keep moving forward. Also ask your school if you can play in assembly or in your music class. This is excellent preparation. I have sent all the Youtube links to your pieces in past emails. If you cannot find the links, please ask me again. You should listen to the pieces every day before you practice and ensure that your rhythm and dynamics match perfectly. This must be part of your daily practice for exams as this will help greatly with the aural section.There are several online resources or apps you can use to practice this every day. Sight-Reading is worth 14% of the marks – as much as the entire scale book! Keep working through the Specimen Sight Reading tests for your grade. If you have an iPad, then the excellent ABRSM sight-reading app is available for your grade. Ask your parents or friends to test you on the scales in a random order. Or you can make a ‘scale pot’ where you write out the name of every scale, broken chord, arpeggio etc and put these into a pot. Take one out of the pot and practice it until the pot is empty! As always, this must be done every day. 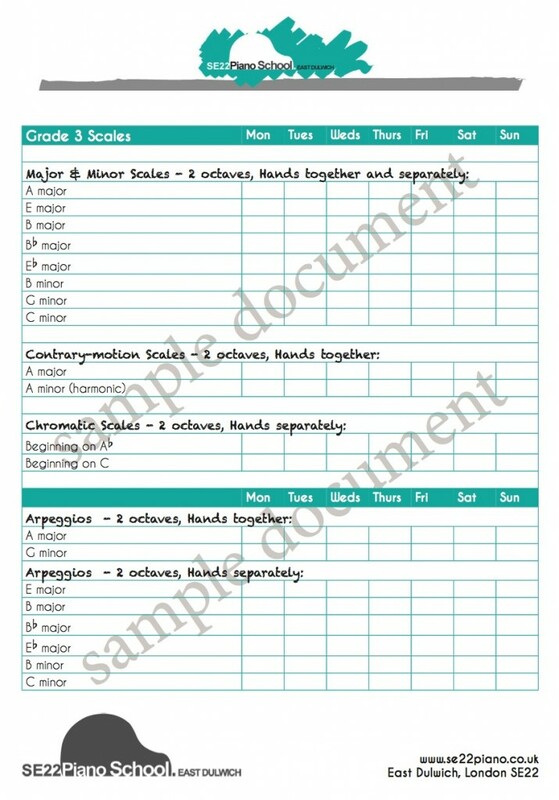 We give all our students practice charts for their scales. These should be filled in daily – aim for ticks in all the boxes! Print a fresh chart each week. Students that work hard at their scales usually see a great improvement within just a few days. Practice your scales in random order so that you’re not always starting at the beginning of the book. In the run-up to the exam, daily practice is vitally important. To cover all the requirements for Grade 1, at least 30 minutes is needed and the time for practice increases by about 15 minutes daily for each grade. However, quality practice is of importance, so there is no point spending half an hour just practising your pieces but neglecting the other requirements. Make sure you practice your weaker areas first. It is important that parents supervise practice to ensure all the requirements above are covered thoroughly! I have been doing mock exams each lesson. Please have a read through the mock exam to see what level your child is currently playing at and what grade they can expect on the day. The mock exam form will also highlight any weak areas that need particular attention. Please print some Mock ABRSM Exam Forms and bring to your next lesson. 9. Criteria used by the examiner in awarding a pass, merit or distinction. Details of the exam marking scheme and what the examiner is looking for can be found here. Safiya, Grade 3 ABRSM Piano, Distinction. Click here to view more exam results. This entry was posted in ABRSM, Associated Board of the Royal Schools of Music, Aural & Ear Training for Pianists, Exams, iPad apps, Mock Exams and tagged ABRSM Exam preparation, ABRSM Piano Exam, Daily practice guide for music students, Daily practice schedule for pianists, How to prepare for your music exam, Piano Exam Preparation, Practice tips for music exam candidates, Preparing for a music exam. Bookmark the permalink. Hope it goes really well for you – what date is your exam?? Can u plz give me a guidance for preparation? coz there’s nothing to learn here where i live.. I have to learn it online all the things..
Maybe you can find a reputable online teacher for Skype lessons? i am preparing for my grade 7 violin abrsm exam on march 2016.
can you suggest me on aural? Sure – google E-music Maestro to find lots of great online aural training resources. Good luck! I’m doing my grade 8 piano and am self teaching, and was wondering if you could recommend some music for sight reading practice? Best of luck with the exam!